4 How Long Can You Keep Plain Yogurt? Natural yogurt is expensive and perishable. It's less costly when bought in the larger sizes, but your family may not be able to eat a quart before its expiration date. If you are unable to eat all of your natural yogurt, you can save it by freezing it. Another reason to freeze natural yogurt is to make a frozen yogurt dessert. Stonyfield Farms and Fage Yogurt, two top makers of natural yogurt, provide directions for freezing natural yogurt. Prepare your yogurt. If it is in small, unopened cartons, wrap the whole carton tightly in plastic wrap to prevent freezer burn, and then pop it in the freezer. Use within a month or two. 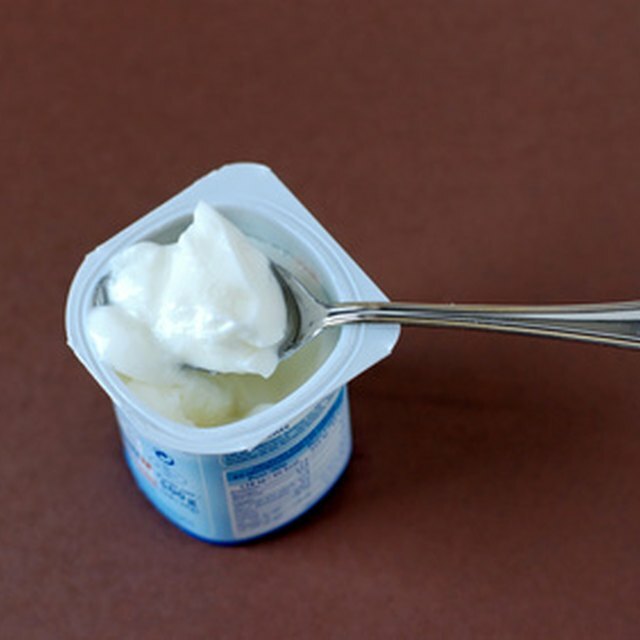 Transfer the yogurt into smaller containers with air-tight lids if you are freezing yogurt from a large tub. Freeze and defrost as needed. Make frozen yogurt. Beat egg whites, cream, vanilla and any other flavorings you like into your yogurt, put it in the freezer. Remove and stir every half-hour or so until it is frozen. Store for 4-6 weeks. Or use an ice-cream maker, following the manufacturer's directions for frozen yogurt. Fage has several recipes for frozen yogurt on its website. When you are ready to eat your yogurt (unless you have made it into a frozen yogurt dessert) let it thaw at room temperature, then stir it a couple of times before eating. Frozen yogurt desserts have less fat than most ice cream. The beneficial bacteria in yogurt is still viable once it thaws, either in your kitchen or in your digestive tract. Once yogurt thaws, it will not have the same consistency as fresh, natural yogurt. What Types of Fruit Can You Mix With Milk Kefir? Can You Reduce Age Spots With Yogurt?